This recipe for Chewy Brownies is another winner from America’s Test Kitchen! The goal, at least for me, was to make brownies from scratch that at least matched my favorite box brownies. Needless to say, these brownies were outstanding and there is no need for me to buy brownie mix anymore. These brownies ended up being chewy, very chocolatey (thanks in part to the chocolate chunks in them), and a developed a thin, glossy, crisp crust on top that cracked a little as I cut them into squares. These Chewy Brownies are made with three different types of chocolate: cocoa powder, unsweetened chocolate, and bittersweet chocolate. There is also what seems to be an ungodly amount of sugar (only because there is a good amount of unsweetened chocolate in this recipe), but in the end, this really isn’t a very sweet brownie. Unsweetened chocolate is chopped into small bits and gets melted into the cocoa powder (and espresso powder) with hot water. Bittersweet chocolate chunks are thrown into the batter right before being poured into a prepared 9×13 pan. This recipe comes together extremely quickly, but waiting for it to cool is another story! These brownies need to cool for a total of at least 2 hours and 15 minutes before you can cut them! Like box brownie mixes, these Chewy Brownies ended up having that glossy crisp top that I love. These brownies were neither too fudgy, nor were they too cakey; they were very a happy medium, which is perfect, in my opinion. My brownies actually stuck to the aluminum foil that lined the pan, even though I coated it with non-stick spray. I successfully removed the brownies by inverting the brownies onto another cutting board (so it was up-side down), peeled off the foil, then flipped it again so it was right-side-up. 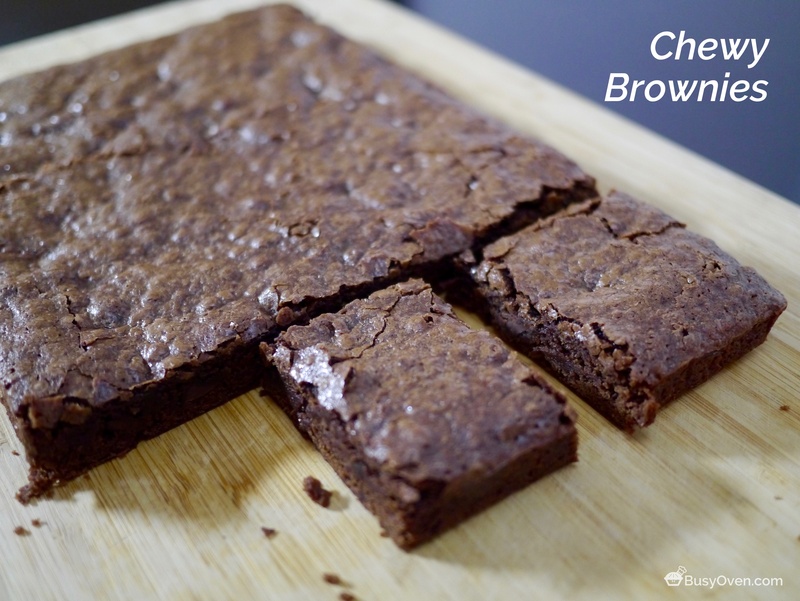 For the chewiest texture, it is important to let the brownies cool thoroughly before cutting. If your baking dish is glass, cool the brownies 10 minutes, then remove them promptly from the pan (otherwise, the superior heat retention of glass can lead to overbaking). Leftovers can be stored in an airtight container at room temperature for up to 4 days. Adjust oven rack to lowest position and heat oven to 350 degrees F. Make a foil sling using the following steps: Cut 18-inch length foil and fold lengthwise to 8-inch width. Fit foil into length of 13 by 9-inch baking pan, pushing it into corners and up sides of pan; allow excess to overhang pan edges. Cut 14-inch length foil and fit into width of pan in the same manner, perpendicular to the first sheet. Spray with nonstick cooking spray. Whisk cocoa, espresso powder (if using), and boiling water together in large bowl until smooth. Add unsweetened chocolate and whisk until chocolate is melted. Whisk in melted butter and oil. (Mixture may look curdled.) Add eggs, yolks, and vanilla and continue to whisk until smooth and homogeneous. Whisk in sugar until fully incorporated. Add flour and salt and mix with rubber spatula until combined. Fold in bittersweet chocolate pieces. Scrape batter into prepared pan and bake until toothpick inserted halfway between edge and center comes out with just a few moist crumbs attached, 30 to 35 minutes. Transfer pan to wire rack and cool 1½ hours. Using foil overhang, lift brownies from pan. Return brownies to wire rack and let cool completely, about 1 hour. Cut into 2-inch squares and serve. Chewy Brownies recipe is from America’s Test Kitchen.